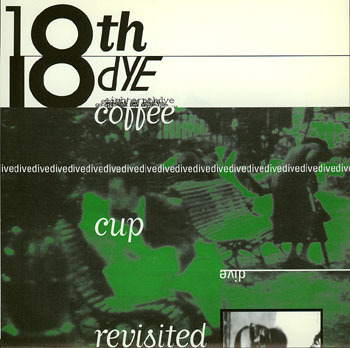 Quixotic Records NYC - 18th Dye, "Coffee Cup Revisited" b/w "Dive"
18th Dye were a Berlin-based trio. 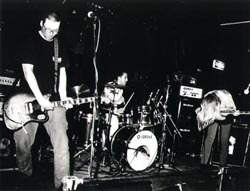 Originally they were supposed to release something with Matador Records, but there was some sort of unavoidable delay. In the meantime, two tracks from the band fell into the hands of Bob W.--of Triage fame--who was preparing to launch a new label of his own called "Dot Dot Dash." Bob offered them as a co-release to Quixotic. In the usual laid-back fashion, the powers-that-be at Quixotic HQ said, "Hey, why not?" and "Coffee Cup Revisited" b/w "Dive" (catalog number QX013-7) was quickly pressed up. This was to be their only Quixotic release, but it made us happy. The rest, as they say, is history. For more information--check out the discography available at the Matador website, and be sure to stop by the official 18th Dye home page.